This was posted to Futility Closet today. 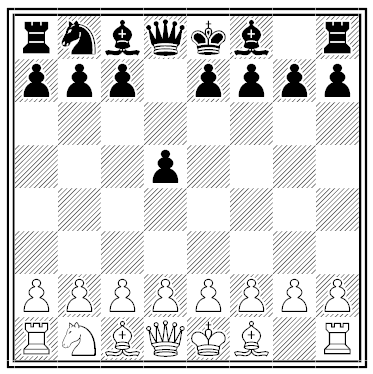 It’s a tricky chess problem credited to Ernest Clement Mortimer. (Thanks to Gerald on Facebook for letting me know I originally forgot to post the problem! This position was reached after Black’s fourth move in a legal chess game. Can you reconstruct the game? via Crime Scene | Futility Closet. Maybe you are interested in chess as I do. I am the giant fan of this challenging game and I was looking for really wonderful chess set for pretty long time. I had luck to find the absolutely beautiful chess set finally. WEXONMART Inc. is selling one for pretty good price. They have a lot of fancy stuff, too.